Servine in game: 188 Who? Important notice! Pokemon Servine is a fictional character of humans. Servine (Japanese: ??? 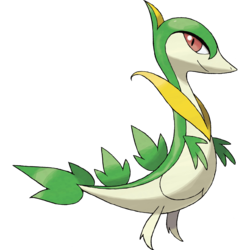 ?— Janovy) is a Grass-type Pokémon introduced in Generation V.
It evolves from Snivy starting at level 17 and evolves into Serperior starting at level 36. Servine is a slim bipedal Pokémon that is primarily green with a cream underside, and narrow red eyes. It has a yellow V-shaped structure that starts at the chest and extends behind the shoulders. Servine has short limbs and a small crest protruding from the back of its head. Three palmate leaves grow along its back and tail. These leaves are capable of performing photosynthesis, but only while they are clean. Servine will go to great lengths to stay dirt-free for this reason. 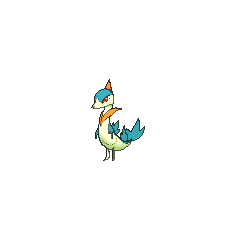 This swift Pokémon hides in thick foliage or shadows to avoid attacks before retaliating. Trip's Snivy was revealed to have evolved into a Servine in A Rival Battle for Club Champ! where it was used in his battle against Ash, and again in Ash and Trip's Third Battle!. It had evolved before Jostling for the Junior Cup!. Servine, along with a Dewott, made its anime debut in The Battle Club and Tepig's Choice!, where it belonged to one of the Trainers at the Battle Club. It battled the powerful Dewott and lost easily. A Trainer's Servine made a brief appearance in A Rival Battle for Club Champ! on a computer screen in the Luxuria Town Battle Club. A Servine made a cameo appearance in Climbing the Tower of Success!. BW004 Servine Ash's Pokédex Servine, the Grass Snake Pokémon, and the evolved form of Snivy. Servine whips its opponents with vines, and dodges their attacks by hiding in the shadows of thick foliage. 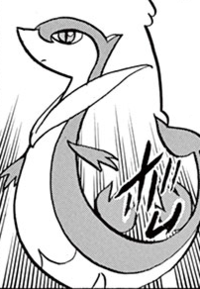 In the Pokémon Adventures Manga, White owns a Servine. This Servine, formerly belonging to N, was sent over to her side after Gigidecides to leave White. She eventually evolves into a Serperior. 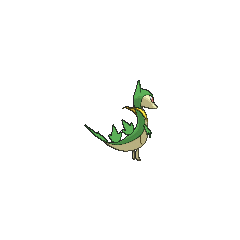 Servine is Monta's starter Pokémon that he first obtained it as a Snivy in the Be the Best! Pokémon B+W manga, a "walkthrough comic" based on the Black and White games. It later evolved into a Serperior. It moves along the ground as if sliding. Its swift movements befuddle its foes, and it then attacks with a vine whip. They avoid attacks by sinking into the shadows of thick foliage. They retaliate with masterful whipping techniques. When it gets dirty, its leaves can't be used in photosynthesis, so it always keeps itself clean. Moves marked with a superscript game abbreviation can only be bred onto Servine in that game. She was looking for a Pokémon to teach the Grass-type moves that she has mastered. She made Snivy her apprentice. For other sprites and images, please see Servine images on the Bulbagarden Archives. Servine was first seen on an animator's reference sheet for the Best Wishes series, along with Dewott, Woobat, and Axew. Servine's English name, as well as Dewott's, was officially confirmed through the anime in The Battle Club and Tepig's Choice!. Servine may be based on a variety of green vine snake species with a pointed snout, including Oxybelis fulgidus, Ahaetulla nasuta, and Ahaetulla prasina. Servine's color scheme is similar to its species' possible namesake, the grass snake. 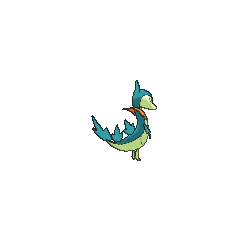 The Pokémon's combination of snake- and lizard-like features is also similar to that of the Florida sand skink, a serpentine lizard with small, stubby legs. The shape of its head, body, and crest may be based on the bird of paradise or false bird of paradise flowers. Ken Sugimori has said that Snivy, Servine, and Serperior are based on French royalty, specifically mentioning the anime The Rose of Versailles as inspiration. Servine's physical features resemble the acanthus leaf motifs popularized during the Renaissance. Servine is a combination of serpent and vine. Servant or a form of the word serve may also be involved. Janovy may be a combination of ? ja (snake) and canopy or ivy. Korean ?? Syabi Possibly from the English word sharp (?? ), shah (? ), or a corruption of ?/? sa, and a corruption of the English word vine(??). Mandarin Chinese ??? Qingténgshé Literally "Green vine snake". May also be from ??? chángqingténg.